This Sportster Frisco mount gas tank will sit up higher on your backbone than the standard tank. These Narrow style, 2.1 gallon gas tanks are top quality, heavy gauge steel with an offset filler bung that accepts a thread-in Harley-Davidson style gas cap. These tanks feature a single 1/4 inch NPT petcock fitting at the lowest point of the tank for maximum miles on the road. This is far superior to other Frisco Sportster style gas tanks that have a petcock bung on the flat bottom of the gas tank, as when your gas tank is mounted to your frame's backbone it is at an angle, and this traps a lot of gas which cannot be used as it is below the petcock bung location. This design with the offset petcock bung on the very back of the tank allows you to use all the gas you can fit in there! Frisco refers to a style of motorcycle that originated in the Bay Area of San Francisco. Typically these 'Frisco Style' bikes would have all extraneous parts removed, stripped down to the bare assentials, narrow and nimble. Often the gas tanks would be lifted in the front so that sat up higher, allowing for maximum amount of gasoline usage in the tank. Thus the term Frisco mount, which generally means a very shallow tunnel so the gas tank sits up high on the frame's backbone. 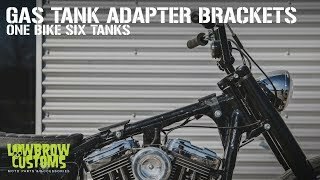 Pair this tank with a set of Lowbrow Customs Gas Tank Adapter Brackets and this custom gas tank will bolt on 1986 - 2003 Harley-Davidson Sportsters with no fabrication required. This is the best shaped tank you can buy, it has all the traditional peanut lines without the flat spot or wide ugly fat width that a king tank has. Just buy it already, you won’t regret it. Tank was shipped fast, quality was great and it looked great on my bike ! Another great product from lowbrow ! Great tank! The position and overall shape is very pleasing to the eye. Good quality materials used. oui je suit tres content de ce reservoir et j apprecie beaucoup les produits lowbro custom.je viens de comander un second.et un autres aussi.